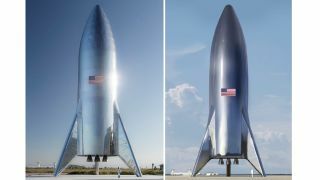 The photo of the Starship that Elon Musk shared on Twitter (left), and an artist's rendering (right). Credit: Elon Musk via Twitter. Elon Musk has shared the first photograph of the Starship, the latest spacecraft being developed by his space exploration company, SpaceX. Formerly known as the Big Falcon Rocket, the Starship has been designed with the goal of one day helping to establish bases on the Moon and Mars. Musk posted the photograph of the Starship to his Twitter account, with some people noting how textured the exterior of the spacecraft is in comparison to the computer render that was teased a few days before. In 2017, Musk claimed the Starship would be able to "take you anywhere on Earth in 60 minutes" – but if you're already dreaming of speedy commutes around the world, you'll be disappointed to know that the image shared by Musk only shows a test vehicle. It's intended to undergo suborbital flights, with the first expected in March/April of this year, before hopefully moving on to orbital flights in 2020. This means Musk's apparent plans to move to Mars could become a reality sooner than we thought. Saying that, there are a number of obstacles that need to be overcome before we can even consider colonizing Mars, including how to land a one-ton vehicle on its surface, and – if the first humans ever want to return to Earth – how to blast off from the surface of the planet. Only time will tell if SpaceX or NASA wins the race to the red planet – but right now it looks like things are progressing rather quickly at Musk's space exploration company.